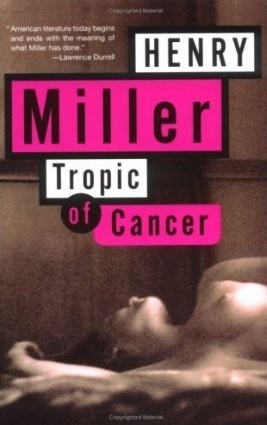 Determined to complete the Back-to-the-Classics Challenge this year, I marched on through my banned book classic: Tropic of Cancer by Henry Miller. I don’t know what possessed me to pick this, and now I’m not exactly sure what to make of it, since it’s quite an appalling and unpleasant book to read. And yet, once I was a quarter of the way into the narrative, I was strangely hooked. The subject matter, superficially, is repetitive and self-absorbed. The style, annoyingly rambling, is not my cup of tea. But this is extreme writing and it packs a wallop. Miller, the narrator, gives a fictionalized memoir-like account of his Paris revel, written while he was wandering the city, living on the streets, off his friends, and off the minimal proceeds of intermittent low-level jobs. He’s always hungry, sometimes on the verge of starvation. He’s usually drunk. He never actually seems to be writing, although he talks about writing with his artist and writer friends. And he spends most of his time pursuing women, mostly prostitutes, for sexual encounters. From time to time he pines for the wife he left back in the United States, but he’s also infatuated with a woman who is more or less linked with another friend of his. His friendships are all superficial and based on mutual dependency. His deepest emotion seems to be his love for Paris, primarily its seedy underside. The novel is a series of semi-chronological anecdotes. They are not, in themselves, very interesting. But the descriptions underlying it all are extraordinary. He breathes life into characters as superficial as he is. His emotional responses to the ordinariness of walking about, or his job as a proof-reader, or his relief in sponging a meal off an acquaintance, make his actions seems somehow larger. Miller is wallowing in failure and yet, whenever he is about to despair, he finds something to focus his attention upon that lights him up again. The book was banned for its explicit sexual content. For its time, it was absurdly racy. Now it doesn’t come across so much as boldly innovative as simply crude. Women in the novel are props to be exploited and demeaned. The men, narrator included, are disgusting, with no redeeming qualities except, perhaps, for their willingness to share with each other the little they have. This book doesn’t have a lot to recommend it except for the remarkable prose and occasional flashes of insight, but that is, surprisingly, enough to recommend it. I don’t think I’ll read anything else of Miller’s, but I’m glad to have gotten through this one. I’ve read Scott before, Waverly and The Heart of Midlothian, and while I admired the author’s skill and enjoyed both books, they were a bit dated in terms of readability. So I approached Ivanhoe with some trepidation. And it does start off slowly. We are introduced first to a variety of peripheral characters with the principals shrouded in mystery. The reader has to be patient to get into the actual tale. The hero of the story, Wilfred of Ivanhoe, is a young Saxon knight who served King Richard on Crusade, much to the annoyance of his father, Cedric, an old-blood Saxon nobleman who despises the Normans on principle as well as for good reasons. (Prince John is causing mischief in England, proving that the Normans are no good.) Cedric has a good friend, Athelstane, who is the last in the line of old Saxon kings. And he has a beautiful ward, the Lady Rowena, who is descended from King Harold. He wants them to wed and found a new dynasty to throw off the Norman oppressors. The fact that Rowena and Wilfred are in love is an obstacle to Cedric’s plans, so he disinherits his son. That’s the backstory. Now, Wilfred returns in disguise. He comes partly to show Rowena he is still alive and still faithful. But he’s also staying more or less close to his king, who has returned from the Crusade after being freed from captivity in Austria. Richard has come to reclaim England from John. He’s also disguised and traveling in secret until he can amass his followers. In addition, the reader meets Isaac of York and his beautiful daughter, Rebecca. They are Jews, and much of the plot revolves around the persecution of Jews as well as their avarice and wealth. Scott manages to both expose the bigotry of the times and to reinforce the stereotypes, which makes this part of the book doubly disturbing. The good guys (the Saxons, Richard the Lionheart, and Robin Hood) must contend with the powerful bad guys (the Knights Templar and the barons supporting John.) There are sieges, battles, tournaments, and ambushes as well as knights courting their ladies. The adventures pile one on another, interspersed with the narrator’s commentary. It’s great fun, especially with the witticisms of Cedric’s jester and Friar Tuck added in. 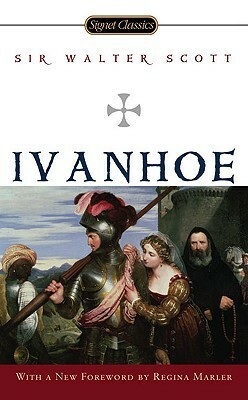 I can understand why Ivanhoe is one of Scott’s best known and most popular books. For old fashioned medieval adventure, it’s truly a classic. I have this book on my e-reader from Netgalley and I hope to get to it soon. 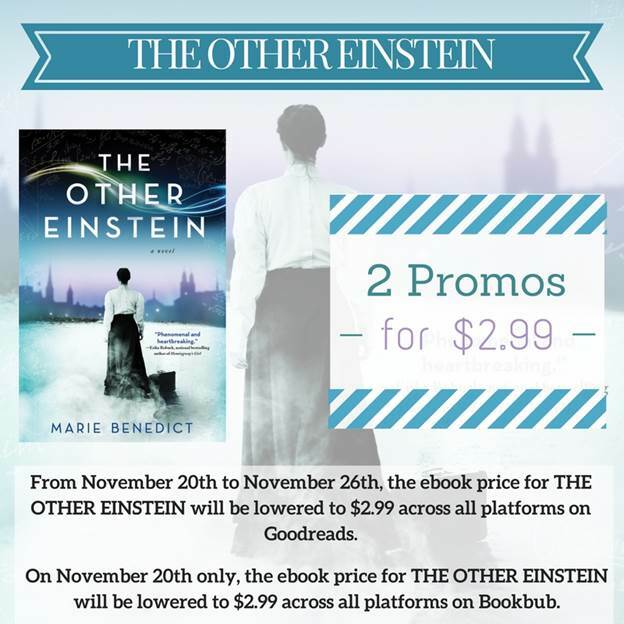 In the meantime, I'm passing along this promotion for anyone who might be interested! 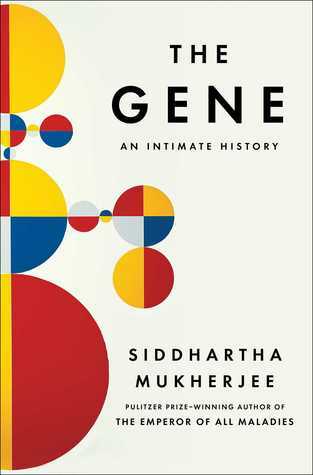 Siddhartha Mukherjee, author of the amazing popular science book, The Emperor of All Maladies: A Biography of Cancer, has a new book out: The Gene: An Intimate History. As in his first work, Mukherjee mixes the human element (the strivings, successes and disappointments of real people, this time mostly scientists) with a heavy dose of scientific explanation, in order to introduce the reader to a vast topic. The history of man’s understanding of the gene is complex and fascinating. This lengthy book takes us back to Darwin and to Mendel and his peas, and follows the unfolding drama of genetic discovery right up to the present, to the Human Genome Project and the beginnings of gene therapy, with all the ethical and moral dilemmas this knowledge presents. Mukherjee has a gift for synthesizing large amounts of information and presenting it in a readable, clear way. The most engaging parts of the story follow the important people in the history of genetic discovery. The book gets more bogged down when discussing the science. Although the author’s ability to illustrate complicated ideas in a comprehensible fashion is impressive, the line between going too far into the weeds to explain crucial experiments and skimming over the details to present a summary of the significance of results is a very difficult line to walk. At times, the balance is a bit off. I found myself wanting a more in-depth description of some of the experimental processes. At the same time, I felt that the author’s emphasis on some of the more crucial concepts grew repetitive. Given the scope of this remarkable book, readers shouldn’t be put off by a little unevenness. To grasp the enormous strides made in understanding life itself that have been driven by an increasing understanding of genes, this book is a must-read. It may not be as compulsively readable as The Emperor of All Maladies, but The Gene demonstrates once again that Siddartha Mukherjee is a brilliant communicator. Nothing like a good book to absent myself from the real world for a while. I decided to go with a back-to-the-classics challenge book because I wanted to immerse myself in some intense reading. I chose Lord Jim by Joseph Conrad which is my "adventure" pick. The plot is fairly straightforward. A young man named Jim has romantic visions of going to sea. In the dramas he envisions, he plays an adventuresome and always heroic role. Jim is a fine sailor, good at his craft. He is hired aboard the Patna, a passenger ship chockful of pilgrims, and his mettle is tested. The rusty old boat strikes something and starts taking on water. It’s the dead of night and the pilgrims are sleeping. The seamen in charge of the boat decide to run for their lives. Knowing there are not enough lifeboats for everyone, they try to quietly release one for themselves. While Jim does not actively participate in preparations for escape, he does, in the end, take advantage of the safety boat. The men are picked up by a passing ship and returned to port, where their crime of deserting ship is discovered. The others take flight again, and Jim is left to bear the full weight of the official inquest. The punishment meted out by the officials is nothing compared to how Jim is prepared to punish himself. He had been given an opportunity to live out his dreams of heroism and nobility, and he failed. After a nomadic second act, where he tries to outrun his reputation, he is given a true second chance. He’s sent to be an agent at a trading post beyond the end of civilization in a place called Patusan. He can reinvent himself. He can be what he always believed himself capable of being. Until a final reckoning comes. The plot is straightforward but the psychological drama of Jim’s life is not, and the real story being told is that of Jim’s inner life–something that is not knowable. The narration is an attempt to get at that unknowable story. What makes this such a remarkable novel is the way in which the story is told. Jim’s adventures are related by a narrator named Marlow, an older, more distinguished sea captain, who is caught up by the notoriousness of the Patna and finds himself captivated by Jim at the trial. Jim tells a pared down truth during the inquest, but confides all to Marlow one evening over supper. On the strength of this slight acquaintance, Marlow takes it upon himself to aid Jim. It gives him a stake in what Jim makes of his life. Marlow tells the story in a round-about way, interjecting background of peripheral characters and telling some other marginally related stories along the way. Events are not presented chronologically because Marlow moves around and tells the story in bits and pieces to whatever audience is present at the time. Occasionally he comes across characters with something to add to the story, so that is thrown into the mix as well. Jim tells us bits in his own words, but even these words are filtered through Marlow’s narration. As Marlow is constantly taking a step back, and confessing he can’t really understand Jim, he reminds the reader that we can’t entirely understand Jim either, even when we think we do. Conrad’s prose is impressively overwhelming. Some of the passages I pored over, enjoying every word, particularly some of his character descriptions. At other times, I had to let my eyes skim for a while because it grew exhausting–but I didn’t want to put the book down. Hurray for the back-to-the-classics challenge! 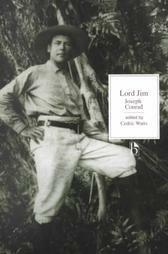 Our copy of Lord Jim has been on our bookshelf for years, but I never would have read it if not for the challenge. I’ve been reading a great deal more historical mystery in the past couple of years, mainly because I’ve found a couple of fun series that keep me coming back for the next installments. One series I particularly enjoy are the cozy Kurland St. Mary Mysteries by Catherine Lloyd. 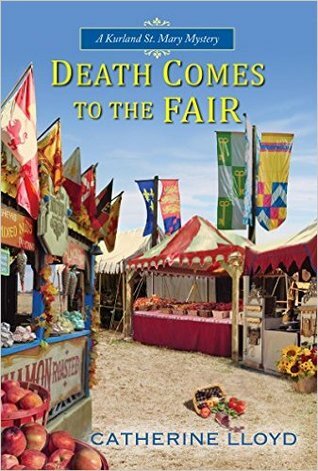 Book Four, Death Comes to the Fair, will be released this month. The reluctant pair of detectives, Miss Lucy Harrington and Major Sir Robert Kurland, are attempting to plan their wedding. Robert wants something quick, small, and local. Lucy would like that as well, but she has to bow to the wishes of relatives who insist on a large society bash, preferably in London. Meanwhile, the concerns of Kurland St. Mary—where Robert reigns and where Lucy has grown up as daughter of the rector and so is intimately involved with the community—take precedence. Currently, that involves a local fair. Lucy guides Robert to take on the responsibility of judging the vegetables, a chore he takes at face value rather than with any degree of tact. He finds the whole thing rather silly. And when it turns out he’s awarded the lion’s share of the prizes to just one man, the verger, he scoffs at Lucy’s concern that it will cause trouble. It’s just vegetables! Then the verger turns up dead. An accident? Or murder? Can villagers be so disgruntled over the distribution of prizes at a fair that they will resort to murder? Or is there something more complex and sinister afoot? So, yes, there is an inordinate amount of murder going on around this couple, but these mysteries are all so well crafted that all the mayhem is believably unfortunate. To get the full flavor of the relationship between the protagonists, you should start with book one: Death Comes to the Village. Roger Kurland is irascible and rather high-handed, but he meets his match with the unflappable Lucy Harrington. In the first few books, they have the argumentative type of relationship typical of the genre that develops into mutual regard and then love. There is a good balance between the mystery solving and the romance. The current novel starts rather slowly. The relationship is settled and requires little in the way of development, so the interactions between them are fairly bland. And while the fair and the vegetable judging dilemma work well to set the stage, there isn’t a whole lot of tension until things get going. It’s a slow build, but the pace picks up and then you won’t want to put the book down until the clues all fall into place and the intrepid pair are back on solid footing. This series continues to entertain and I’ll be waiting impatiently for book five.